This tutorial details how to setup a Flask application on a server running Ubuntu. Wait, why do we need two servers? 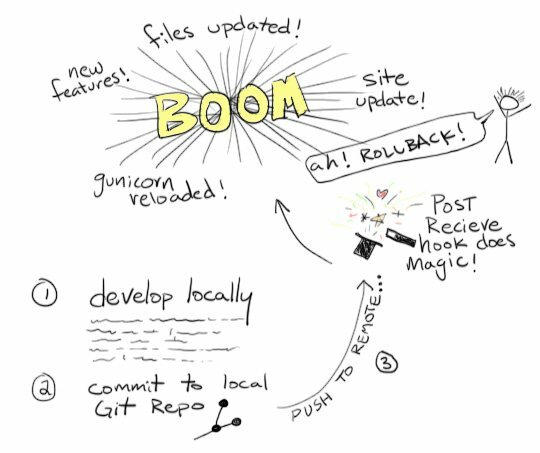 Think if Gunicorn as the application web server that will be running behind nginx - the front facing web server. Gunicorn is WSGI compatible. It can talk to other applications that support WSGI, like Flask or Django. Need access to a web server? Check out Digital Ocean, Linode, or Amazon EC2. Alternatively, you can use Vagrant to emulate a Linux environment. This setup was tested on both Digital Ocean and Linode. The end goal: HTTP requests are routed from the web server to Flask, which Flask handles appropriately, and the responses are then sent right back to the web server and, finally, back to the end user. 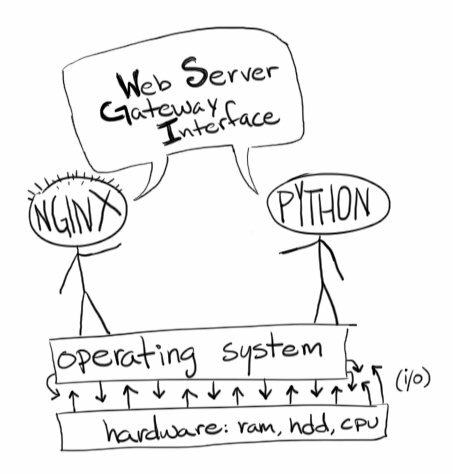 Properly implementing a Web Server Gateway Interface (WSGI) will be paramount to our success. Let’s get the basic configuration setup. To create a new user with ‘sudo’ privileges. Within VIM, press I to enter the INSERT mode. Add the code, then press Esc to leave INSERT mode to go into COMMAND mode. Finally type “:wq” to save and exit VIM. Here, we remove the default nginx configuration, create a new config file (called flask_project), and, finally, set up a symlink to the config file we just created so that nginx loads it on startup. So, HTTP requests that hit the / endpoint will be ‘reverse proxied‘ to port 8000 on 127.0.0.1 (or the “loopback ip” or “localhost”). This is same IP and port that gunicorn will use. We also indicate that we want nginx to directly serve the static files from the “/home/www/flask_project/static/” directory rather than routing the requests through gunicorn/WSGI. This will speed up our site’s load time since nginx knows to serve that directory directly. The latter command manually runs gunicorn on localhost port 8000. Open your browser and navigate to http://your_domain_name_or_ip_address. Again, you should see the “Flask is running!” message. Test out the other URL, /data, as well. If you navigate to http://your_domain_name_or_ip_address/static, you should see “Test!”, indicating that we’re serving static files correctly. So, we have a working Flask app; however, there’s one problem: We have to manually (re)start gunicorn each time we make changes to our app. We can automate this with Supervisor. Make sure your app is still running at http://your_domain_name_or_ip_address. Check out the Supervisor documentation for custom configuration info. In this final part, we’ll look at using a post-receive Git Hook along with Git, of course, to simplify the deployment process. Quick tip: displaying the git branch on your prompt will help remind you of where you are at while trekking through the terminal. Now on every push, the new files will copy over to the app directory, “/home/www/flask_project”. Make sure to update the IP or domain name. Check out your changes at http://your_domain_name_or_ip_address/data. Do you really want to manually configure a server? Sure, it’s great for learning, but it’s super tedious, as you can tell. Fortunately, we’ve automated the process with Fabric. Along with setting up nginx, gunicorn, Supervisor, and Git, the script creates a basic Flask app, which is specific to the project that we’ve been working with. You can easily customize this to meet your own specific needs. You should remove the username and password from the file and either place them in a separate config file that stays out of version control or set up SSH keys on the remote server so that you do not need a password to login. Also, be sure to update the env.hosts variable to your IP or domain name. Your app should now be live. Test this out in your browser. Check your app again in the browser. Make sure your changes show up. Again, this script is specific to your project at hand. You can customize this to your own needs by updating the config section and altering the tasks as necessary. Things are bound to go wrong from time to time once you have code on production. Everything may work well on your local development environment only to crash in production. So it’s important to have a strategy in place to quickly revert a Git commit. Take a quick look at the rollback task from the fabfile.py, which allows you to revert changes quickly to get a working app back up. You can then update your code locally to fix the bugs, and then re-deploy. Want to take this workflow to the next level? Add a pre-production (staging) server into the mix for testing purposes. Deploy to this server first, which should be an exact copy of your production environment, to test before deploying to production. Utilize Continuous Integration and Delivery to further eliminate bugs and regressions with automated testing and decrease the time it takes to deploy your app. Please leave questions and comments below. Be sure to grab the code from the repo.